Whether it’s the weather or the PSL’s, it seems like everyone I know is in a perpetually good mood now that fall is here. It’s been a perfect time for me to unwind from a chaotic summer and have a few easy nights at home. Here’s everything I think you need to have the perfect one. Face Mask. In my book, every perfect night starts with a face mask. In addition to being seasonally appropriate, pumpkin is packed with a plethora of skincare benefits thanks to the AHAs and vitamins. Essentially, it’s an exfoliant that brightens and smooths out your skin, while fighting sun damage and signs of aging. Yeah, kind of a big deal. I’ve been loving the Overtime Mask from Summer Fridays lately, but I also really enjoy the Peter Thomas Roth one that I was able to try in this kit! Reading Material. 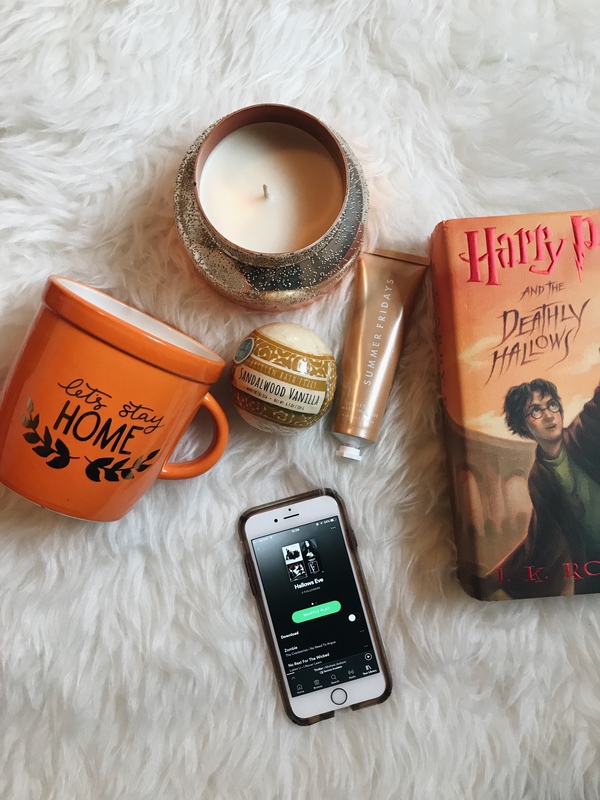 Something about fall always makes me want to reread Harry Potter (B and I just marathoned all the movies over the past couple weeks, so that helped). I also have been loving the Dublin Murder Squad series, so I’ll probably be diving into Tana French’s latest The Witch Elm this weekend! Bath Bombs. As a germaphobe, there is nothing I hate more than the idea of marinating in my own filth. However, it’s hard to deny the stress benefits of baths. Lately I’ve been having to force myself to run one every few weeks (even if it means I have to shower first!) I picked up a few of these bath bombs from Ulta and this Sandalwood Vanilla one just may be my favorite so far. Mug. Whether your mug is for the perfect bedtime tea or seasonally appropriate chocolate…you do you. This one is from Target (I couldn’t find it online) but I also love this one and this one. Candle. 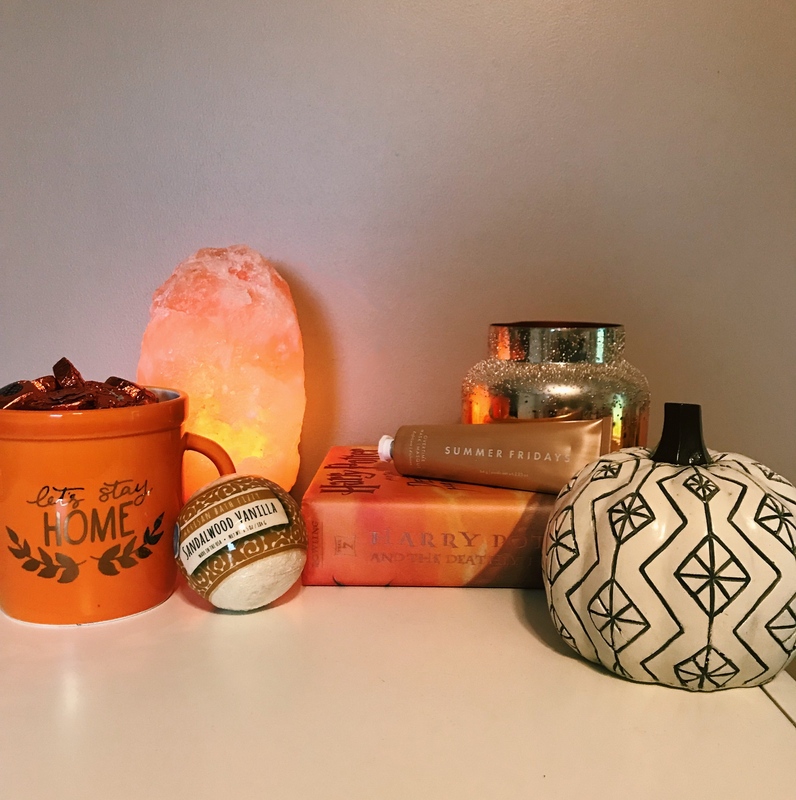 There’s a seemingly endless variety of autumnal candles in the world. This year my top choice is this Pumpkin Clove one from Anthropologie. Playlist. I may have gone a little overboard with my spooky-pop playlist, since it’s 9 hours long. But that doesn’t change that it’s perfect for getting in the Halloween spirit.